Freedom is one of the most common values and desires. Financial freedom, access to monetary resources or money-creating strategies to have experiences of value and secure our future, is usually at the top of the list of the freedoms we most desire. But one that many women don’t even hope to attain. Ramat Oyetunji provides the inspiration to attain financial freedom in her new book, Fifty Shades of Green: A Stock Market Guide for the Financially Independent-minded Woman. I love Ramat’s take on “financial fantasies” – making the study of investing more fun than I expected, and the expectation of living a life of abundance more realistic. She takes the fear out of investing, explaining the stock and bond markets in terms everyone can understand and with suggestions you can put to use immediately, whether you’ve just started your first job and have your first paycheck in hand, or are a career woman who has neglected to save for the future. Ramat’s book offers a simplified approach to investing, mixed in with a little bit of irreverence – linking everyday examples like shopping in a mall with investing concepts – to help readers feel confident about investing. And Ramat offers investing tips at the end of the book that you don’t want to miss! In this time of almost zero interest rates in savings accounts, we all need to know how to grow our money and beat inflation without fearing we will risk it all. 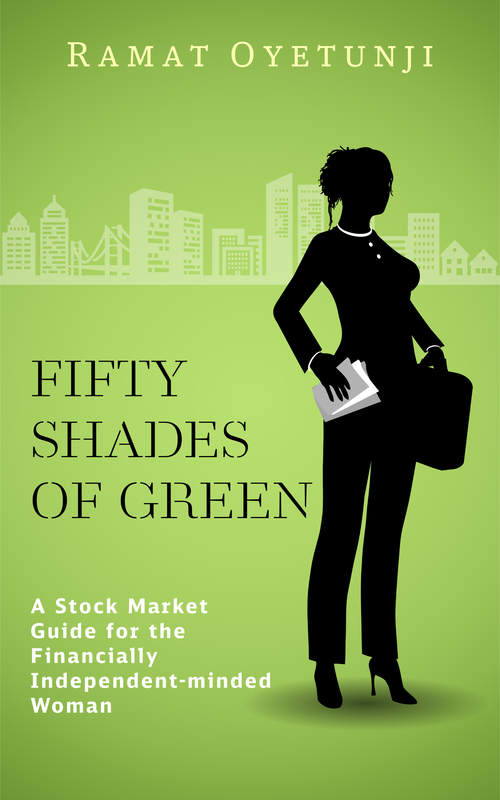 Here, Ramat Oyetunji, a passionate investor, answers my questions about Fifty Shades of Green. She graduated from the University of Maine with an MBA and has 15 years of experience investing in the stock market. BECCA: Why did you write about finance specifically for women? Ramat: I am passionate about empowering women, and gaining financial independence. I know from first-hand experience, and studies confirm it, that women lag behind men when it comes to financial knowledge, growing a nest egg, and gaining financial independence. We live longer than men do, and are more likely to outlive our money, which makes financial independence all the more important for us to strive to achieve. BECCA: What do you see the #1 issue women face in becoming financially independent? RAMAT: I believe that a lack of confidence with regards to finances is the #1 issue standing in the way of women becoming financially independent. The financial steps and actions taken by women is the most important factor to achieving financial independence, and a lack of confidence leads to inaction. Women can counter that lack of confidence by continually improving their financial knowledge, which is one of the things I hope to achieve with my book. BECCA: What does it take to feel more confident about investing? RAMAT: Some initial steps are gaining a better understanding of how the stock market works, an understanding of how the most common investments (stocks, bonds and mutual funds) work, and an understanding of the different ways to participate in the stock market (such as through a 401(k) or IRA). BECCA: Did any of your personal experience inspire you to write this book? RAMAT: Yes. I was laid off from my first job in 2002 and that experience has been one of the driving forces behind my passion for investing and financial independence. Being unemployed highlighted the importance of having money saved, and because the interest rate on savings accounts were, and still are, well below the inflation rate, it highlighted the need for a better investment strategy. I see other women in the position that I was in, and others that don’t have an investment strategy because of a lack of knowledge or fear of the stock market, and I want to use my book to encourage and empower them to take action. BECCA: What tools do you offer on your website to help people achieve their financial goals? RAMAT: My website offers some simple tools to begin the journey towards achieving financial goals, such as a simple budget with suggested targets, various calculators including one that calculates how much you will need to meet your goals, and a few other tools like a comparison of online brokerage firms. BECCA: What will readers gain from your weekly blog? RAMAT: Readers will gain insight into how the stock market events of that week could affect their current investments or investment strategy, and suggestions on steps that they can take in response to major events. I will also continue with the theme of the book by using easy-to-understand terms to explain stock market events in the blog. BECCA: What suggestions do you have for other first-time writers who feel they have an important message to share? RAMAT: Your message is important, and there is someone out there waiting for your book and your words. Keep writing and shaping your message, but set a target date for when you will finish/publish it. There is always one more thing you could add or refine, and that could lead to a book that is never finished or read by others. For more information on Ramat Oyetunji, and investing, visit www.thefiwoman.com. Many thanks, Ramat and Becca. This is such sage advice for those of us who want to maximize our savings and earnings potential in 2015.